One of the joys of the 4-Way String Project is bringing people of different ages and backgrounds together through music. This year, for the first time, we have two volunteers to help us, and each one offers our kids guidance in their own unique, important way. 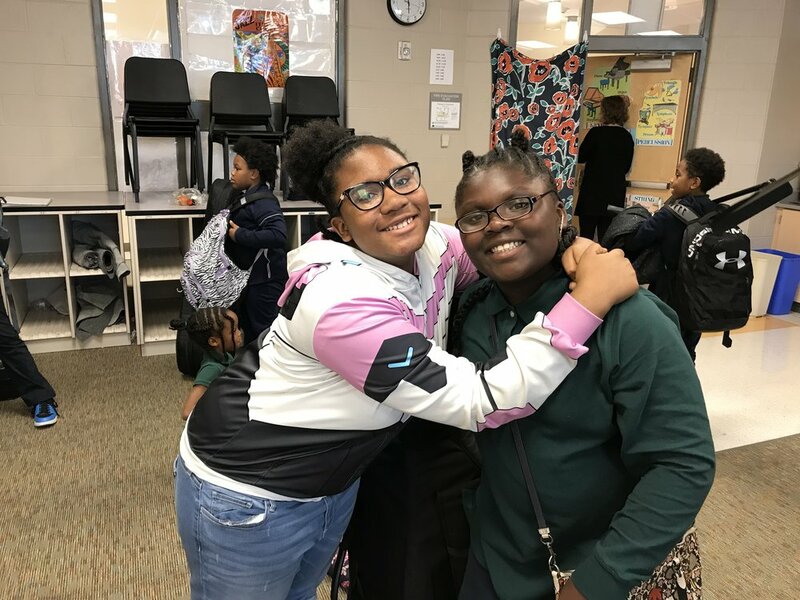 Meet Madison (left), a 7th grader who was in the program its first two years, and now comes back each Tuesday to help mentor her former Woodford classmates. Madi now attends Clark Montessori, one of Cincinnati’s premier high schools, but one which unfortunately doesn’t yet have a strings program. By volunteering with us, she gets to keep studying violin, shows her younger peers the value of commitment to their work, and stay connected with friends. And you can see the effect she has – Shaylin is so excited to have her back! Edmund Choi is a lifelong violinist, playing in several local orchestras while holding down a day job, as a professor of molecular genetics (!) at the University of Cincinnati. I met Ed on my street (he’s my neighbor) after hearing him practicing in his sunroom. He’s quickly become a favorite of our students, and they look forward to working with him each week. 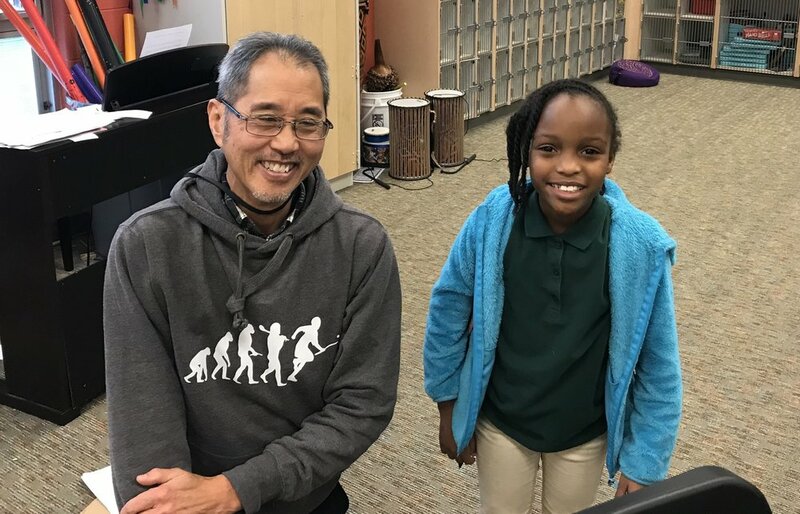 As someone who learned to play the violin in San Francisco public schools, and has never stopped, he also shows our students how much joy a lifetime of music making can bring, the rewards of sticking with it, and that musicians can be very good at other things, too! I hope we can have him explain what he does at UC, and how playing the violin helped him get where he is. Both Ed and Madi are wonderful additions to our teaching staff, and we’re very grateful for their willingness to help, and remind our kids that they can continue a life filled with music once they leave us. As Giving Tuesday approaches, please consider donating to the 4-Way String Project - we are always grateful for your support! The second year of the 4-Way String Project finished a couple of weeks ago, and to celebrate, we had a performance party! Our students got to show off their skills to their parents, performing solos and in groups, and thanks to our friends at Trader Joe's of Kenwood and the Coffee Exchange of Pleasant Ridge, there were lots of good things to eat and drink! We are very proud of our students, and the work they did this year - thanks to all of our supporters for making it possible! The 4-Way String Project relies on the generosity of Artswave, The Greater Cincinnati Foundation, Matinee Musicale, and many individual donors - please help us continue this work by making a donation! Spring Concert at the KHAC! A couple of weeks ago, the 4-Way String Project returned to the Kennedy Heights Arts Center as part of Woodford Paideia's Art Night! Our students performed solos and small ensemble pieces, and, as you'll see in the background, kept their teachers busy monitoring their sugar intake at the snack table! (Lesson learned - play first, then dessert!). Some of our wonderful 4th graders - from left, Makenna, Charles, Jayden and Pavi'elle. 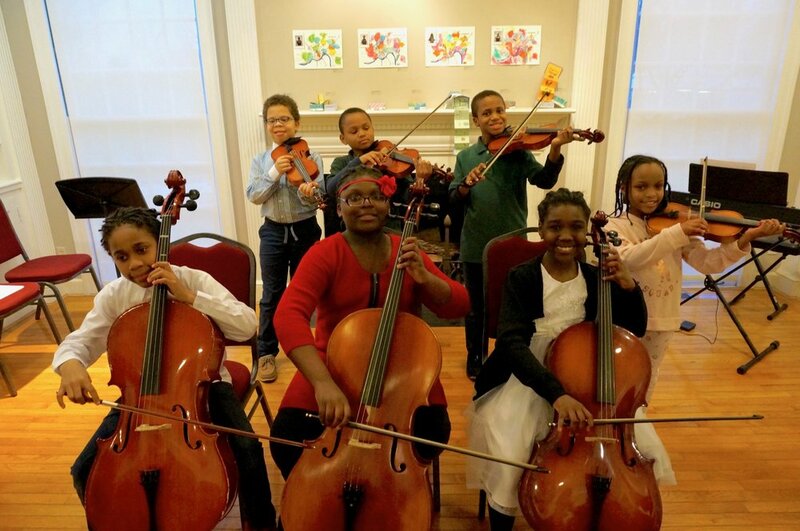 If you enjoy the video, and want to help support our work with these great kids, please consider a donation to the String Project- we can't do it without you! On the left, my first cello teacher, Ardyth Alton. On the right, Shaylin, Woodford 4th grader, and future leader of the free world. Cellists are naturally exuberant people - we believe the sound of our instrument will lead to world peace, and, as our colleagues will tell you, we play extra loud at all times to help bring this about as soon as possible. Today, I want to introduce you to two typically enthusiastic cellists, my first teacher, and my latest student. My first cello teacher, Ardyth Alton, taught seemingly every young cellist in the city of New York when I was growing up. She was known around Juilliard as “the great encourager”, and taught six (and often seven) days a week at an age when many people had already retired. She often wore bright yellow clothes to match her blonde hair, had a big smile that was utterly contagious, and never seemed to be the least bit tired or discouraged by anything. 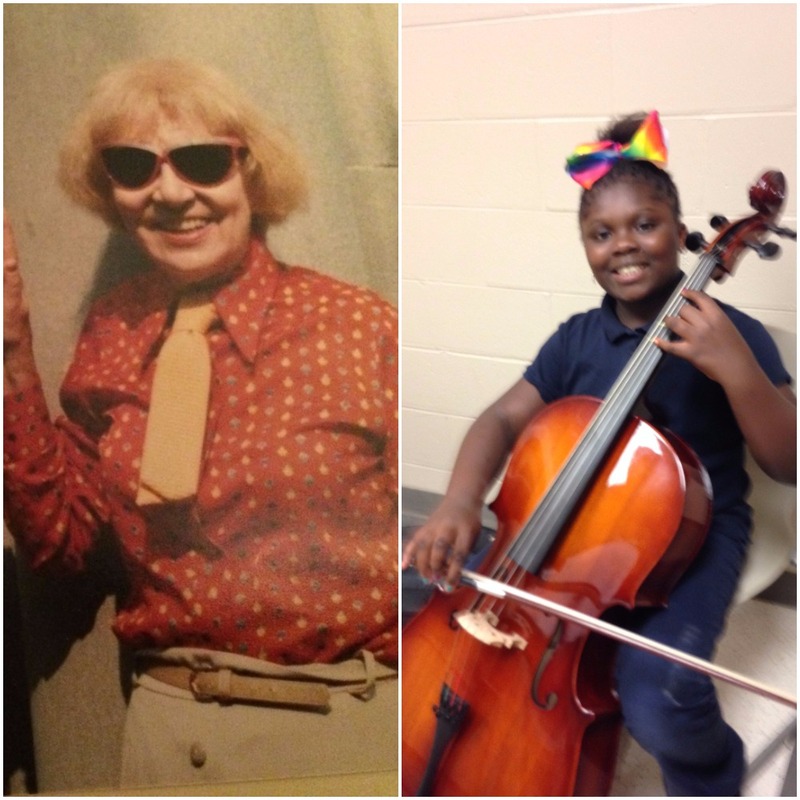 In lessons, besides playing her cello, Mrs. Alton would sing (in a high-pitched voice that all her students loved to imitate), play the piano, dance around the room – whatever it took to get her point across. Forget about Disneyland - her studio was the happiest place on earth. When I teach, I try to do what Mrs. Alton did for me, and show the student that playing the cello is the absolute best thing you can do with your time. There are some students where this takes a lot of work. And then, there’s Shaylin. Like Mrs. Alton, Shaylin favors bright colors (her hair always sports a bow) and is super excited about the task at hand. At her first lesson this fall, Shaylin announced that she wanted to learn “all the songs”. When I explained that this might take a while, she seemed unconcerned, so we got started immediately. At her second lesson, she asked me when I would be giving her more songs (to be clear, I had already given her the music for nine pieces, of which she had learned two). 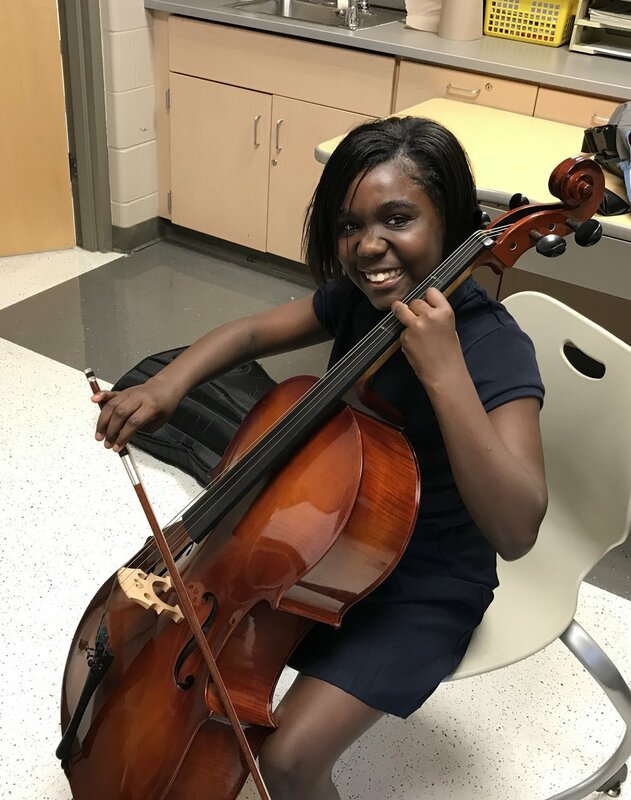 And Shaylin’s self-motivation is not limited to her cello studies - she recently made history at Woodford Paideia Elementary School, becoming the first 4th grader to become student body president. All I can say is, look out - she’ll be your senator very soon. At every lesson, I marvel at Shaylin’s open, enthusiastic way of experiencing the world, and it reminds me why I teach – to help her stay that way. Teaching at a public school serving lower-income students is challenging - many kids can get lost in the shuffle, and I worry about their futures. We can’t reach all of them, but I am certain that Shaylin, and the others we spend time with after school, will be that much better equipped to handle the world’s challenges, because of our work together. Mrs. Alton gave me much more than her love of the cello – it was her nurturing and encouragement that has stayed with me, and enabled me to face life's challenges with optimism and hope. I hope to pass that on to Shaylin, although, she’s clearly well-equipped already – frankly, most of the time it feels like she’s mentoring me! And just as working with Mrs. Alton did, my time with Shaylin brings me joy. So during this season of joy, please consider a gift in support of 4-Way’s work with students like Shaylin – we couldn’t do this without you! Join us for a House Concert! If you can't make it, but would like to make a donation, please visit http://4-WayQuartet.com/education or click the Donate Button - thank you for your support! After our program’s successful first year teaching at Woodford Paideia, we’re starting the second! We’ve already begun working with the kids in their orchestra class, and will be inviting some of them to join us after school over the next couple of weeks. We are looking forward to getting back to lessons and chamber music! We’ve had some changes to our staff, including a member of the quartet itself. For the last two years, violinist William Manley drove from Columbus to Cincinnati to be a part of 4-Way, and we owe him a huge debt of gratitude for the untold hours of his time (and thousands of miles on his car) he gave to us. Will’s willingness to spend an extra three to four hours on the road for every rehearsal, performance, and teaching session was truly exceptional and generous. Unfortunately, the increasing demands of our schedule have made it impossible for him to continue, but we simply couldn’t have established ourselves without his sacrifices, and we’ll always be grateful to him. The challenges of scheduling also mean will have a new violin teacher after school – the amazing Trista Emmons, who was central to making the program a success last year, is stepping aside, and we’ll really miss her. After a full day of teaching strings at Indian Hill Schools, she came over to Woodford, and what she brought to the program really can’t be measured – her violin students thrived, we all relied on her unerring instincts about repertoire and performances, and most important, she created an atmosphere of warmth and encouragement that we will all do our best to continue. Angela Carota will be the String Project’s “nerve center” again this year, and we’re super excited to have her back – this program simply wouldn’t exist without her. Every child at Woodford knows and loves her, and she was instrumental (sorry) in helping us find the kids who could thrive in the program. While Angela was away last year, John Caliguri stepped in, and was central to last year’s success. John did pretty much everything – coaching ensembles, conducting our chamber orchestra, teaching lessons, fixing instruments, and keeping everything going. All this after a full day of teaching over 200 students at Walnut Hills High School! Thank you again, John! So, (drumroll please), stepping into the roles of violinist and after school teacher is 4-Way’s newest member, Jack Bogard! Jack is a Cincinnati native, and graduate of both the School for Creative and Performing Arts and CCM (with a degree in jazz!). He’s studied violin with CSO Principal 2nd violin Gabe Pegis, and improvisation with Paul Patterson. Jack’s also studied samba music in Brazil, and we’re excited to have him share his skills as an improviser in our performances. There are a few of those coming up soon, and I’ll share the details in another post later this week. So, once again, thanks to all those who’ve helped us get this far, including our supporters – we definitely couldn’t do this without you! If you’d like to become one of them, please click the donate button! As hard as it is to imagine right now, school starts in two weeks! 4-Way will once again be in residence at Woodford Paideia, assisting with 5th and 6th grade orchestra, this time for the whole school year. We'll begin our after school program in early September, and we can't wait! In the meantime, here's a video Kevin made with highlights from last year's program - hope you enjoy it! More news coming soon about the program, new supporters, and upcoming concerts - stay tuned!